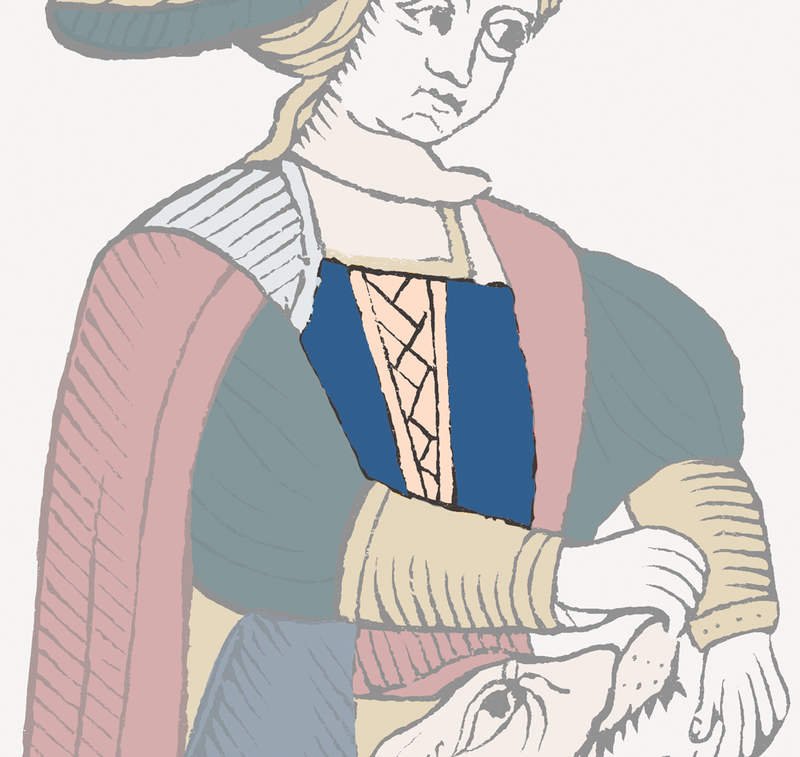 The figure of Strength in the Tarot of Marseille thus seemed to be full of allusions to the image of the chimera described in Book 9 of Plato’s Republic. As with the Chariot, the Devil, and the Lovers, was I observing the reappearance of an image from Greek Antiquity in a card from the Italian Renaissance? Here again, Marsilio Ficino appears to have served as a relay. In the ninth book of the Republic, Plato depicts man’s soul in the following way. It is an assemblage of many heads of monsters arranged in a sort of ring of wild beasts; and from this manifold conglomeration of monstrous heads there bursts, from roots as it were, a sort of tree-trunk, a lion on one side, a dragon on the other. On top of this trunk is a man holding a knotty cudgel in his hand, which he uses to thrash the raging beasts. Finally the skin of a human body envelops all these beasts and makes what is a manifold animal look like just one animal. Plato wants the conglomeration of many beasts to be the insatiable party of concupiscence and the trunk compounded from a lion and dragon to be the force of irascibility, a force that is called a lion when it supports the reason but a dragon when it rebels against it. The man is the reason. Here, obviously, Ficino does not content himself with telling Plato’s tale. Without bothering to warn the reader about it, he deeply modifies the image by his interpretation. First, he complicates its structure, adding a fourth element – the dragon – to Plato’s chimera (composed of only three elements: a multi-headed beast, a lion, and a man). According to him, they both represent the force of irascibility, but it is called a lion when it supports reason, and a dragon when it rebels against it. Then again, reason within us is called Hercules. He destroys Antaeus, that is the monstrous images of fantasy, when he lifts Antaeus from the senses and physical images. He also subdues the lion, meaning that he curbs passion. He cuts down the Hydra with its many sprouting heads, that is, he cuts off the force of desire which, as passion, is borne not into a few things, and those of importance, but into anything whatsoever, or rather into innumerable things, by means of an insatiable whirlpool. A Florentine painting circa 1475 allows us to see the fight between Hercules and the Hydra just as Ficino may have seen it himself. 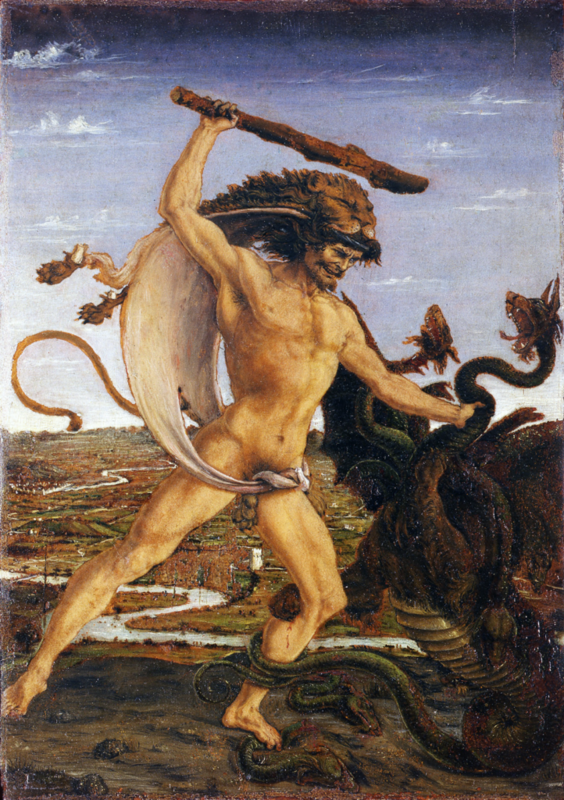 Antonio Pollaiolo, Hercules and the Hydra, c. 1475 (Florence, Uffizi Gallery). Indeed, the painter was Ficino’s friend Antonio Pollaiolo, an artist who also was close to the Medici. Since Antiquity, Hercules was the typical personification of Strength. Now Plato had created his multifarious chimera to illustrate that virtue precisely. It may perhaps be supposed from the writings of the poets that Hercules was a hero who was particularly like the sun, both because the name of Hercules signifies the splendor of glory, which is the more pertinent to the sun, and also because Hercules himself overcame twelve monsters, just as the sun in its perpetual course moves through the twelve living beings of the zodiac as if overcoming them. Therefore, his hard labors proclaim him a Sun hero: At long last the vanquished earth bestows on him the heavens. But neither Hercules lacks a share of the sun’s substance: In fact, Hercules is the power of the sun that provides a godlike valour to the human race. The city bordering on Egypt, which boasts of Alexander of Macedon as its founder, worships Serapis and Isis with an almost crazed veneration. Yet the city gives evidence that it is really offering up that worship to the sun under Serapis’ name, when it sets a basket atop his head or when he joins to his image the statue of a three-headed creature. Its middle head – the largest – has the appearance of a lion; on the right, the head of a dog rears up, tame and fawning; and the left part of the neck ends in the head of a rapacious wolf. A serpent with its coils binds these figures together, while its head returns to the god’s right hand, which keeps the monster at hand. Ficino must have been struck by the resemblance of the Macrobian image of Serapis with that of Plato’s chimera. They both represent a standing, human-like figure accompanied by a multi-headed creature. This observation might have induced him to add to Plato’s chimera two elements borrowed from Macrobius’ text – Hercules and the dragon/serpent – in his commentary (the Latin substantive draco signifies dragon, as well as serpent). Ficino thus amalgamates Plato’s chimera with elements borrowed from solar gods and heroes mentioned in Macrobius’ Saturnalia. Likewise, the figure of Strength in the Tarot of Marseille is not a simple illustration of Plato’s chimera. Beyond the similarities with Plato’s Republic already noted in Episode 18, some details seem to allude to Macrobius’ representation of Serapis. 1) The three animals that make up Macrobius’ multi-headed monster appear on the card: the lion at first sight; the dog, revealed by his falling ear; and the rapacious wolf, whose menacing muzzle appears when the card is turned upside down. 2) The beast’s curly and tangled fleece evokes the coils of the serpent that binds the figures together. 3) The multiple heads of Strength’s animal are exactly under the woman’s right hand, just like that of the monster described by Macrobius, whose head “returns to the god’s right hand, which keeps the monster at hand.” 4) The hat worn by the figure of Strength evokes the “basket atop his head” because of its shape and structure, resembling that of interwoven wicker. 5) The upper part of the hat is bristling with yellow triangular spikes, comparable to sun rays. Nicolas Conver, Strength, 1760, detail of the hat. This figure of the cross is primary; also, of all the figures, it is rectilinear to the highest degree, and it has four right angles. Now it is through the perpendicularity of rays and of the angles that the effects of the celestials most strongly appear, for the stars are much more potent at the time when they occupy the four angles, or rather cardines, of the sky, that of the East, that of the West, and the mid-heaven on either side. When so positioned, they cast their rays one upon another in such a way as to form a cross. The cross therefore, said the ancients, is a figure which is made by the strength of the stars and serves as a receptacle of their strength; it therefore possesses the greatest power among images and receives the forces and spirits of the planets. This opinion was either introduced or principally confirmed by the Egyptian, among whose characters a prominent one was the cross, which signified in their usage the future life; and they would engrave this figure on the breast of Serapis. According to this text, the figure of the cross is an image of the strength of the stars. As a receptacle of their strength, it possesses their might. For Ficino, the graphical representation of the cross is, therefore, related to strength. Ficino notes the antiquity of this sign, affirming that the Egyptians used to engrave the hieroglyph of the cross on the chest of Serapis. 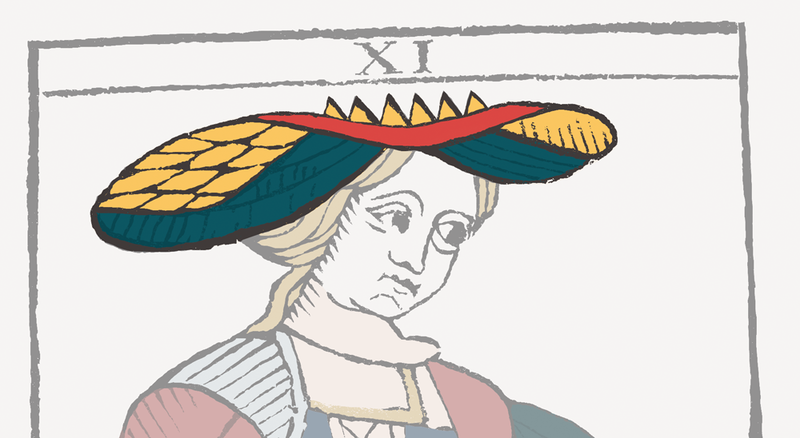 If we turn again to the figure of Strength in the Tarot of Marseille, it is striking to see that the lacing that closes the front of the feminine figure’s dress is represented by perpendicular lines forming crossings, precisely on her chest. Thus, the Strength card appears to be engraved, like Ficino’s Serapis, with the motif of the cross. Nicolas Conver, Strength, 1760, detail of the lacing on the woman’s chest. Ficino, Platonic Theology, xvii, 4, cit., VI, p. 57. The Letters of Marsilio Ficino, vol. 3, London, Shepheard-Walwyn, 1981, p. 61. André Chastel, Marsile Ficin et l’art, Geneva, Droz, 1996, p. 36. We know that Piero the Gouty, father of Lorenzo de’ Medici, had commissioned to Pollaiolo a cycle of paintings dedicated to Hercules’ labours. See André Chastel, Art et humanisme à Florence au temps de Laurent le Magnifique, Paris, P.U.F., 1959, p. 170. The Letters of Marsilio Ficino, vol. 9, London, Shepheard-Walwyn, 2012, p. 49. This corresponds perfectly with Ficino’s non deterministic conception of astrology, according to which man’s highest achievement is to rise above the stars, that is to go beyond the initial conditions given him at birth by his horoscope, and thus earn the skies, meaning the salvation of the soul. Macrobius, Saturnalia, I.20.6, transl. Robert A. Kasler, Cambridge, Mass., Loeb, 2011, p. 271. Macrobius, Saturnalia, I.20.13, cit., p. 275. To be informed when new episodes are published, subscribe to the ‘Villa Stendhal’ Facebook page (go to www.facebook.com/VillaStendhal then click on the ‘Follow’ button).